PANTO season appears to have arrived at Woking Football Club. It was a case of ‘Oh yes he is, oh no he isn’t’ after last week’s eagerly anticipated board meeting, as confusion surrounded the position of the club’s majority shareholder, Peter Jordan. 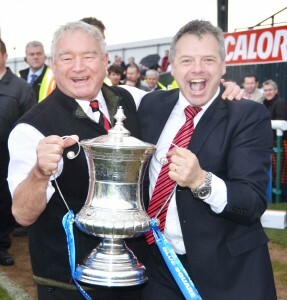 On Sunday, weekly football publication The Non-League Paper reported that Mr Jordan, 60, had informed the Woking FC board of directors of his intention to retire. via the official club website at noon on Sunday, by Chairman Mike Smith. But the original claims have since been substantiated by sources at the club. The revelation comes on the back of last week’s News & Mail reporting that our Sports desk had seen a copy of a letter of intent to buy the club, sent on behalf of local businessman Ashley Read, 34, by Wellers Law Group LLP to senior officials at Kingfield. A subsequent letter received by the News & Mail directly from Mr Read states that, should any purchase to gain a controlling share in Woking Football Club go ahead, it would be funded by him alone. He added that a consortium – understood to include six other parties ‘with football experience’ – is ready to be brought in to run the club with him, in what he calls ‘a new direction to the existing regime’. It is only Mr Jordan’s 75 per cent stake in the limited company – trading as Woking Football Club Ltd – that is subject to the bid. That interest comes despite the club announcing losses in excess of £400,000 (to the year ending May 31, 2015). It is understood the matter, plus a proposal from Mr Jordan that Mr Read fill a current vacancy on the board, were discussed at length at last Thursday evening’s board meeting. It is claimed that Mr Jordan was asked to step outside the meeting while matters relating to Mr Read were attended to. Mr Jordan, who has served as a director at the club since 2005, had yet to issue a statement on his plans to retire as this paper went press. all parties can begin to present a united message on the direction of the club – after many supporters voiced their concerns over a lack of detail concerning recent activity. per cent share of Woking FC and are represented on the board by Ian Nicholson. Mr Read explained that the progression of the deal is still subject to him receiving answers to his due diligence request.